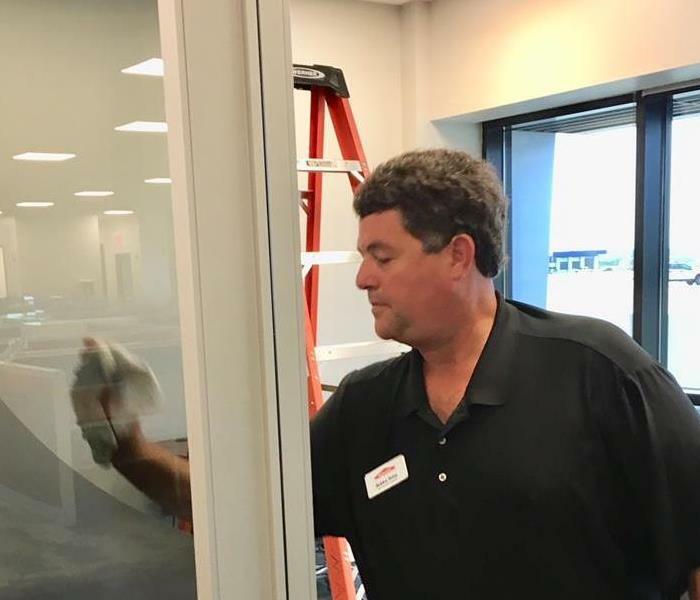 Working hard to get the Huntsville International Airport ready for the Regional After Hours with Huntsville International Airport event put on by the Huntsville/Madison County Chamber and the Madison Chamber of Commerce (MCC)! The new renovations look great! Call SERVPRO of South Madison County for all your Post Construction Cleaning needs! 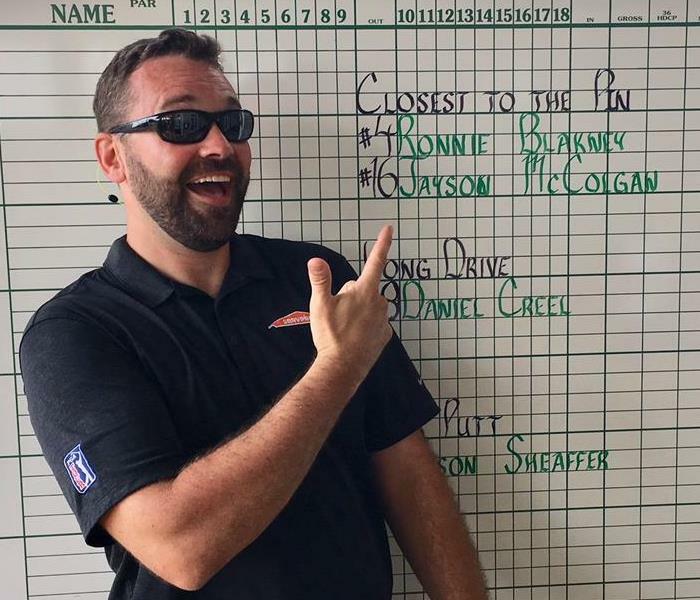 Our Sales Rep, Jayson won closest to the pin at the 6th annual BOMA North Alabama Golf Tournament — at RTJ at Hampton Cove. 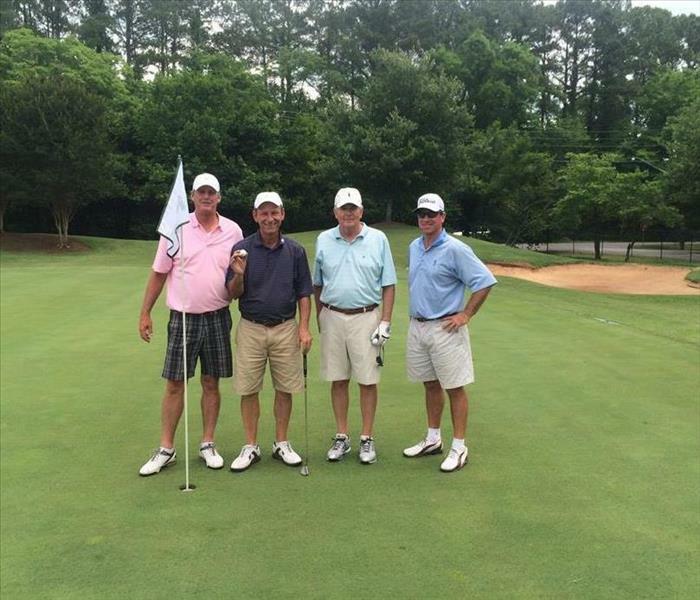 The tournament was held for the benefit of CASA of Madison County. 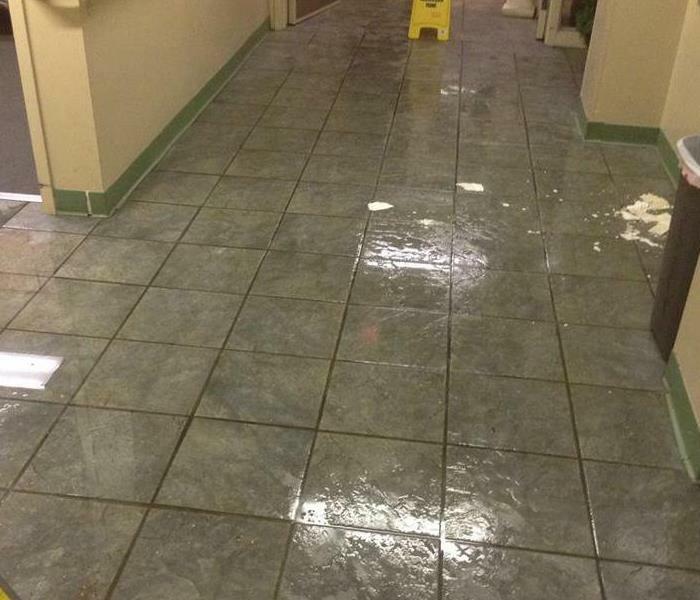 When one of the buildings on the campus of Huntsville Hospital had a water damage, hospital officials turned to SERVPRO of South Madison County to get the damage cleaned up quickly so the facility could continue to see patients. A small fire led to the sprinklers going off in two downtown Huntsville businesses. Both sustained serious water damage. SERVPRO of South Madison County teamed up to handle this large loss. 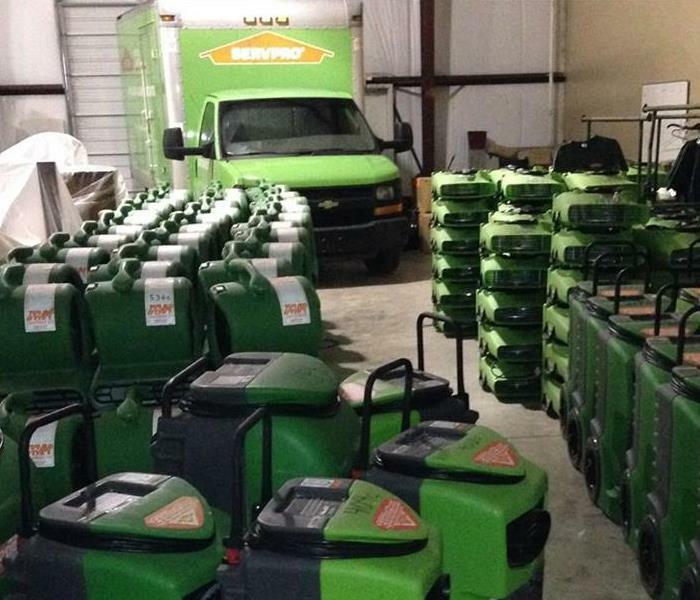 Our team loads equipment in preparation to travel to help other SERVPRO franchises cleanup water damage to homes and businesses after Hurricane Harvey. 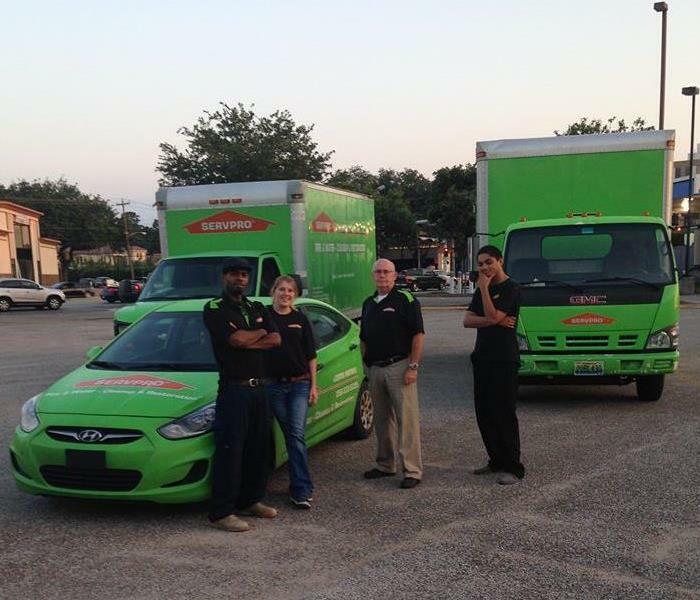 With access to resources on a national level, no job is too big or too small for SERVPRO. 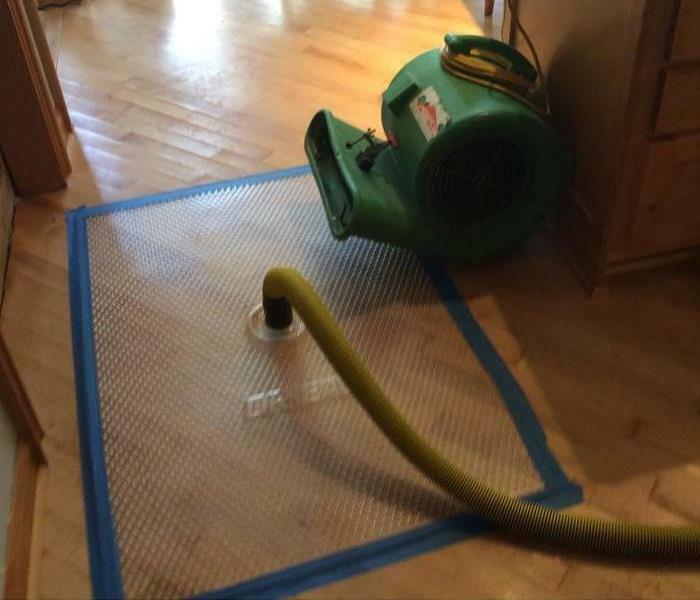 Nevas uses a weighted extraction tool for in-place drying at a water damage in Huntsville. 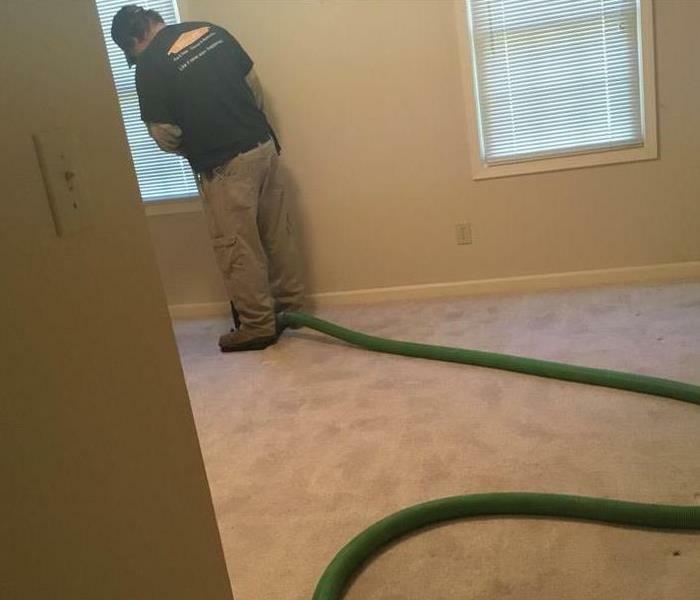 In-place drying involves an experienced and properly trained technician extracting as much of the water from the carpet and cushion as possible while the carpet is still attached to the tack strip. In some cases, a weighted extraction tool can remove 97% of any moisture in your carpets, giving you a BIG head start in the water extraction process and helping ensure your wet carpets are dried more quickly. This is definitely not something you would want to discover when you return home. 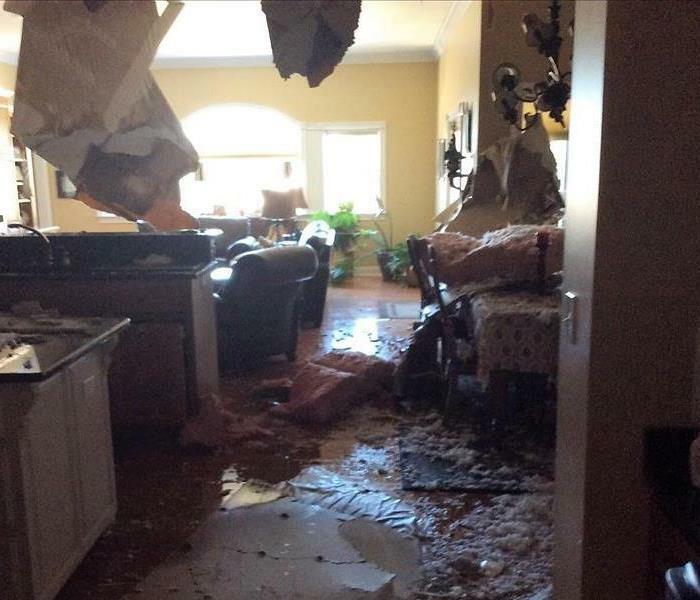 The ceiling of this Huntsville home collapsed from the weight of water damage. The cause was a leaking toilet upstairs. 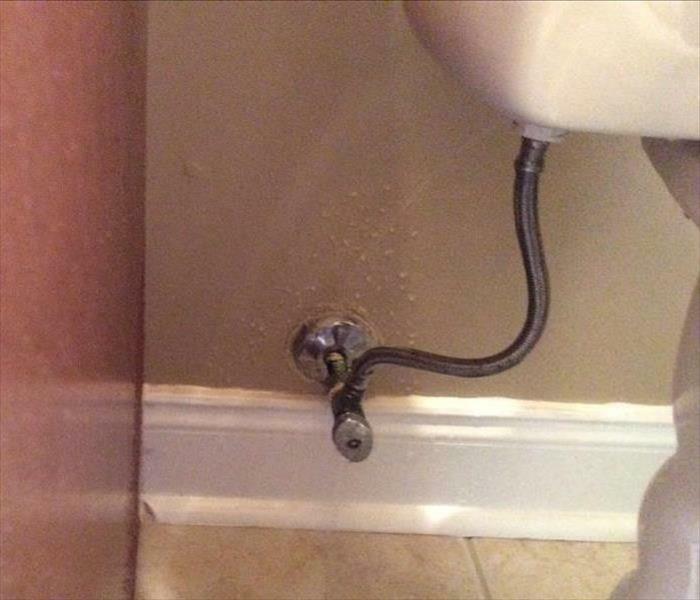 A common cause of water damage is a leaking toilet. 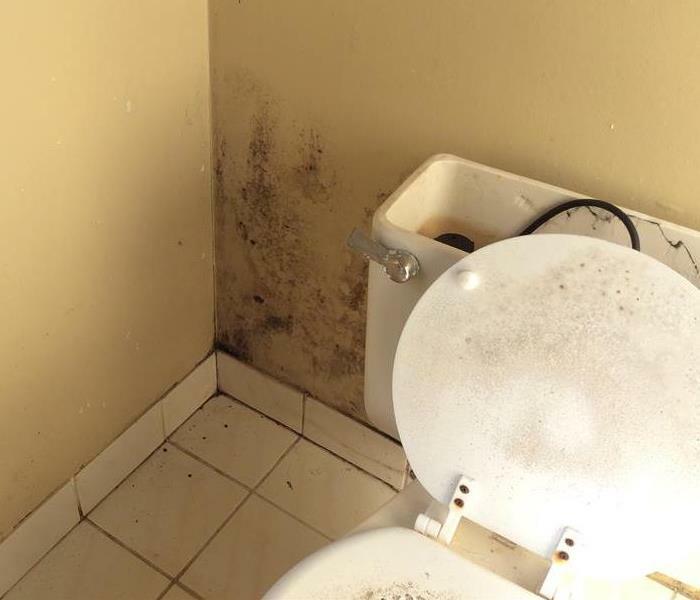 In this Huntsville home, an upstairs toilet started leaking while the homeowner was out of town. When the homeowner returned home, the ceiling in her kitchen downstairs had collapsed (pictured previously in our gallery). 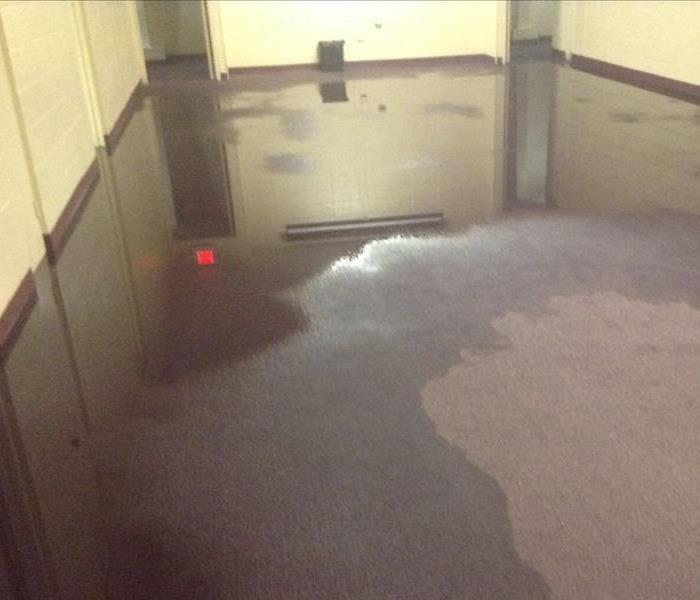 A toilet overflowed in a Huntsville church and caused water damage to 9 rooms. The water damage was discovered shortly before Wednesday evening services. We extracted the water from carpet and tile and set drying equipment. 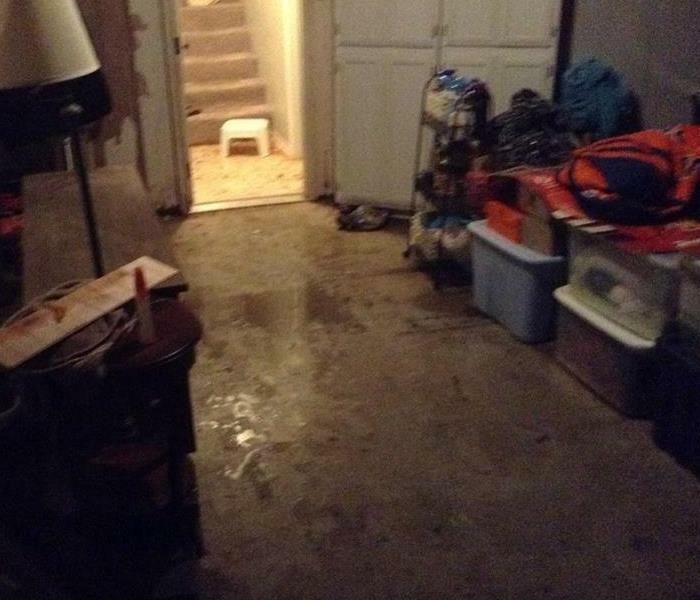 Flood waters from heavy rains caused the basement of this home in New Market to flood. The basement was finished and several rooms were damaged. 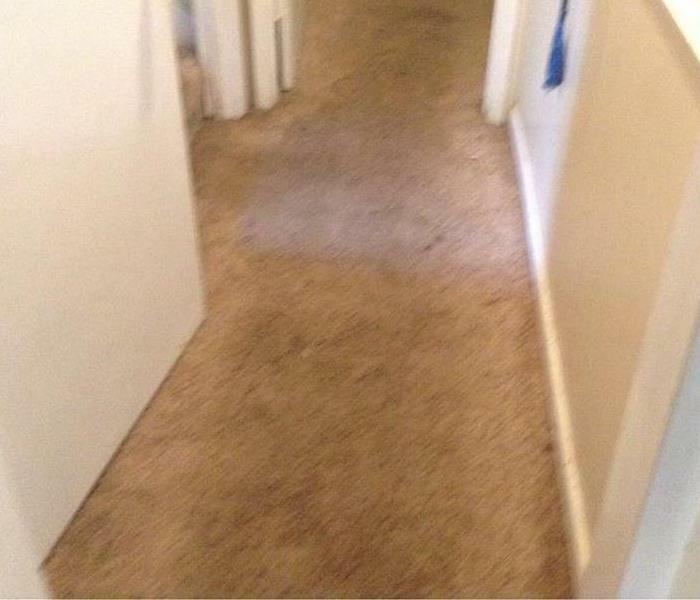 The carpet in this hallway had to be removed as well as a portion of the drywall. This small site is the source of damage for a mold remediation job. Hail damage caused a small leak which wasn't noticed right away. Over time, mold developed and spread. See the before/after photos here. One of our crews works on a mold remediation job in Huntsville. 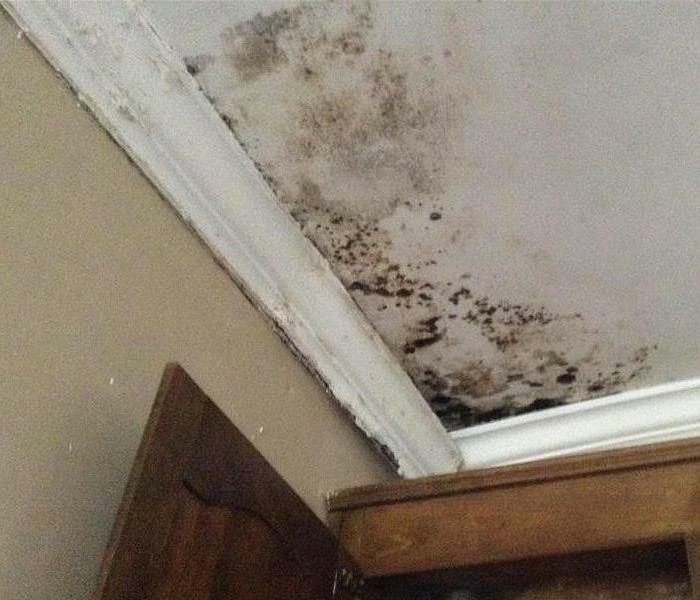 The homeowner discovered mold on her ceiling and walls. The mold was caused by a small roof leak after hail damage three months prior. A stove fire in this Huntsville home caused fire and smoke damage to most of the house. A portion of the cabinets had to be replaced but our crews were able to clean and salvage most of the home's structure and the homeowner's belongings. 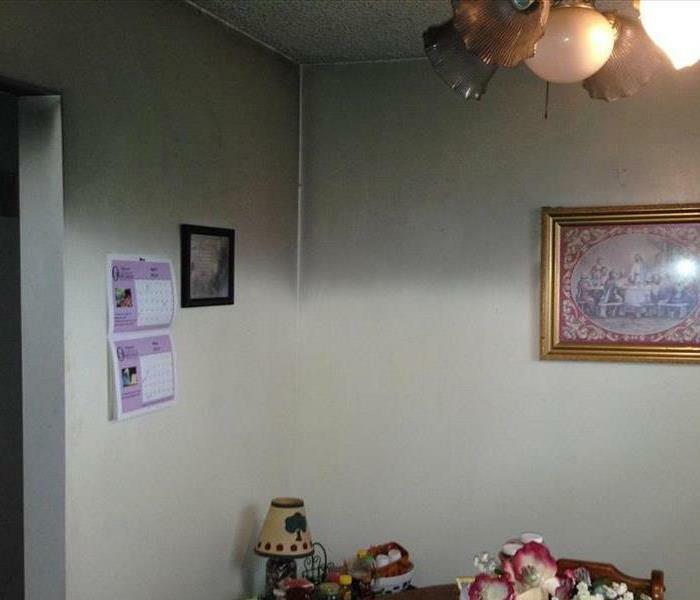 We also have a picture of the smoke damage to the dining room in our Photo Gallery. This is the dining room of a Huntsville home that had fire and smoke damage as a result of a cooking fire. The line of smoke damage is fairly prominent on the top third of the walls. After very heavy rains, flood waters rose quickly and entered this Huntsville home through the garage. 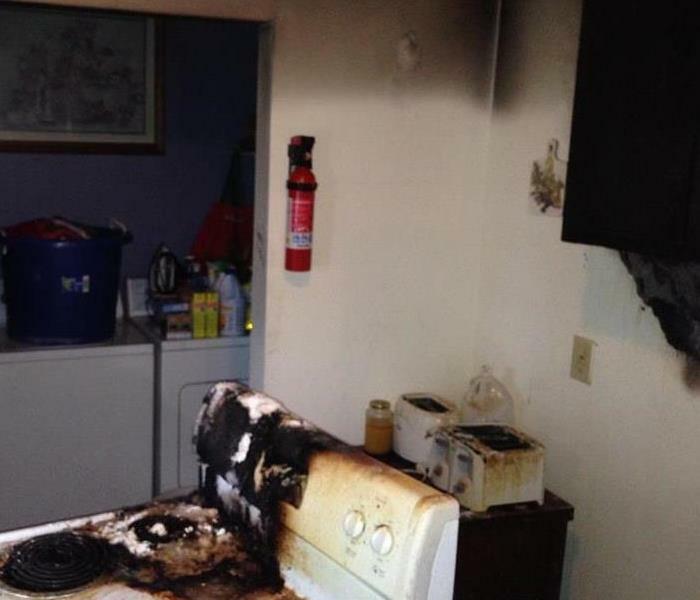 The adjacent laundry room and a bedroom also had flood damage. The garage was mostly used as a storage area. 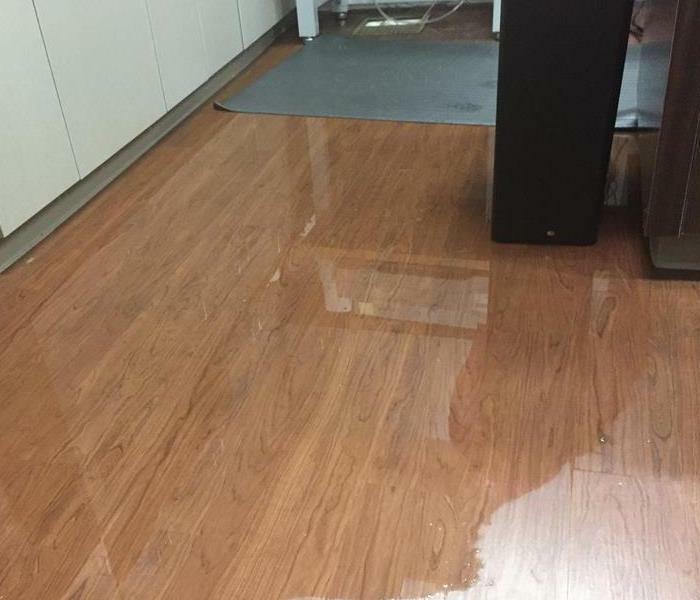 A minor leak caused water damage to this doctor's office in Madison. SERVPRO arrived quickly to extract the standing water and carefully place drying equipment so the office could stay open and continue to see patients in a safe environment. This Huntsville home suffered heavy smoke and soot damage after a fire. SERVPRO of South Madison County crews have the proper training and equipment to handle fire damage cleanup whether the job is large or small. Smoke and soot damage can be heavy or it can be very light. This soot damage in barely noticeable from across the room. Smoke from the furnace caused this soot damage to 5 rooms in this Huntsville home. 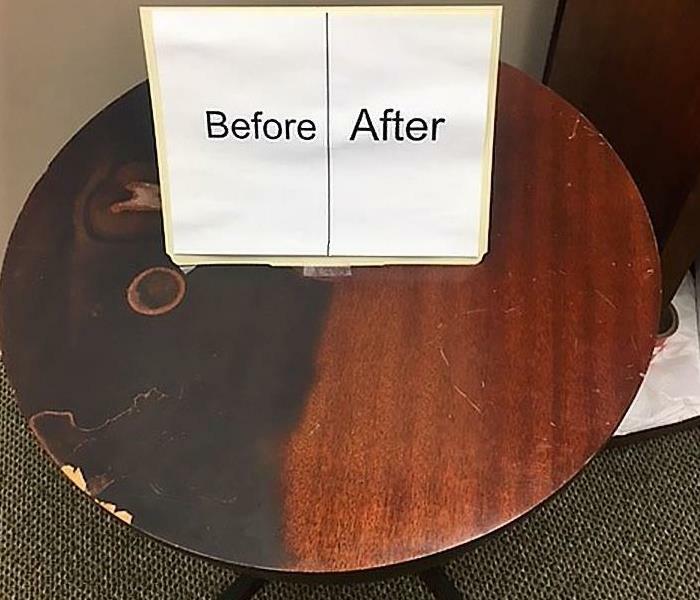 Soot covered this wood table after a fire. We had one of our employees clean only half of it to show our abilities to clean and restore your belongings after a fire. 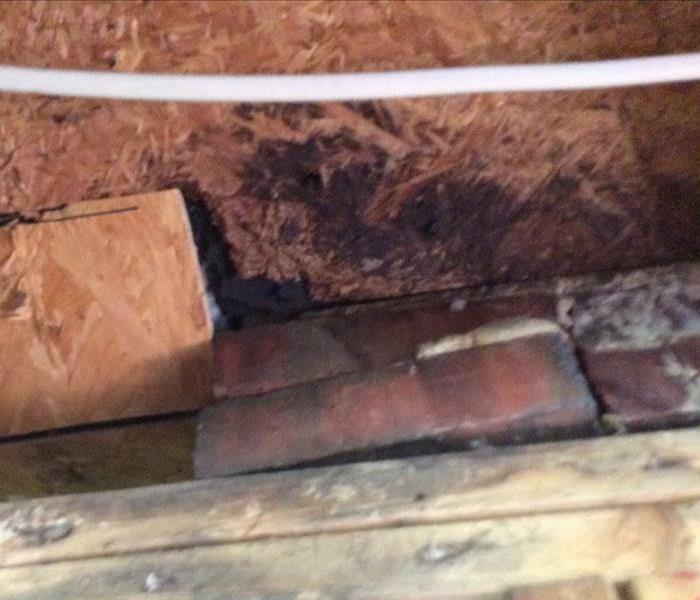 This Huntsville home had soot damage caused by the gas logs in the fireplace. This is an in progress picture of our crew as they clean the soot from the ceiling. At the top right, you can see the difference in the area that has been cleaned. 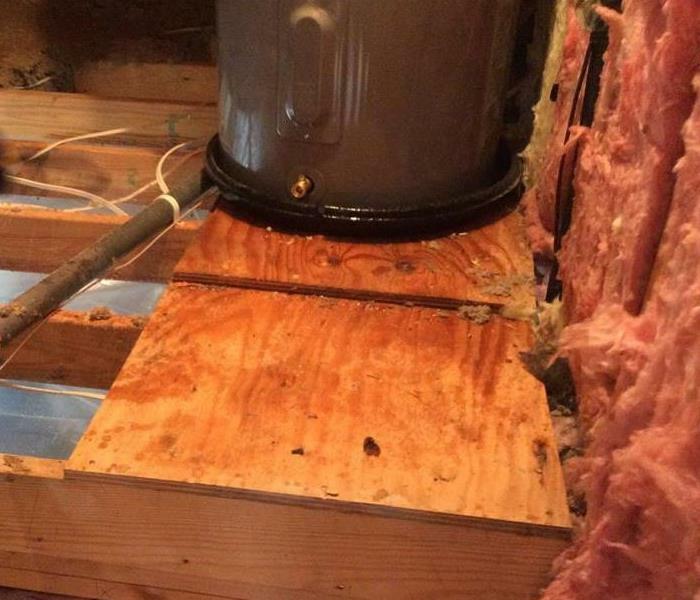 The water heater leaked in this Huntsville home resulting in water damage to the ceiling, walls and flooring in the laundry room and kitchen below. The crawlspace and HVAC ducts were also affected. The water heater leaked in this Huntsville home and water damaged the hardwood flooring in the kitchen. When dealing with water damaged hardwood floors, a fast response and the correct equipment are crucial to prevent damage beyond repair. 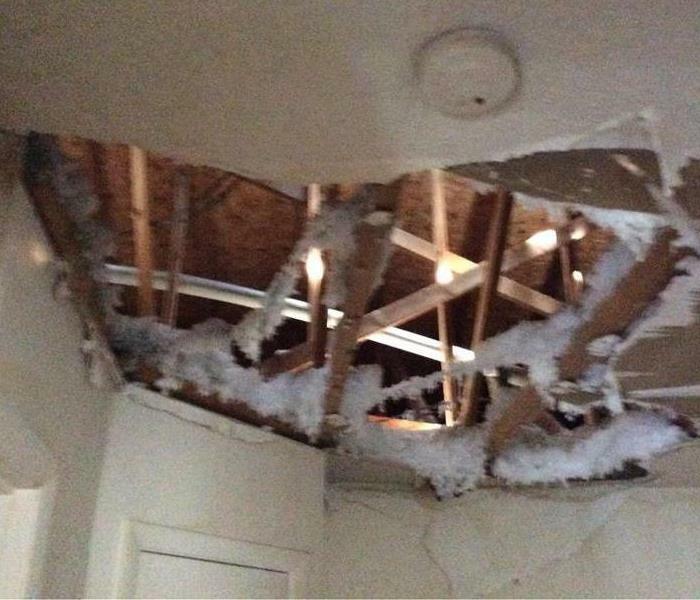 After a thunderstorm caused water damage to the roof of this apartment complex in Huntsville, the ceiling collapsed. 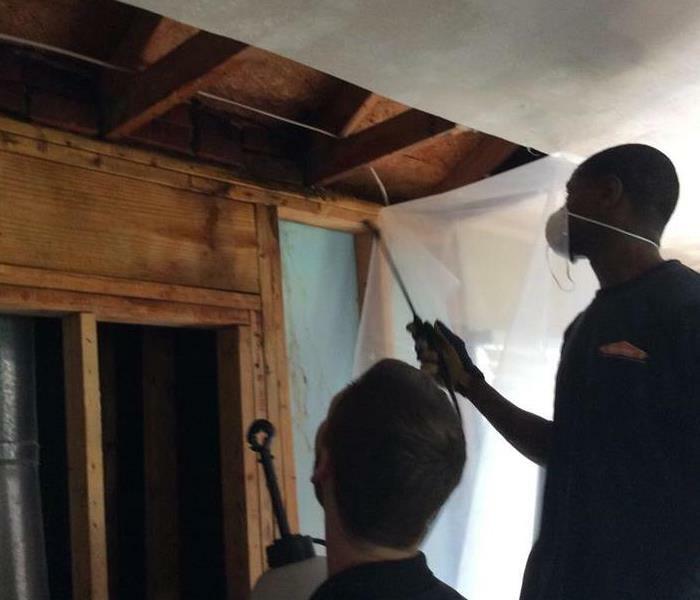 Check out our Before/After Photos page to see the mess created when all the insulation fell. 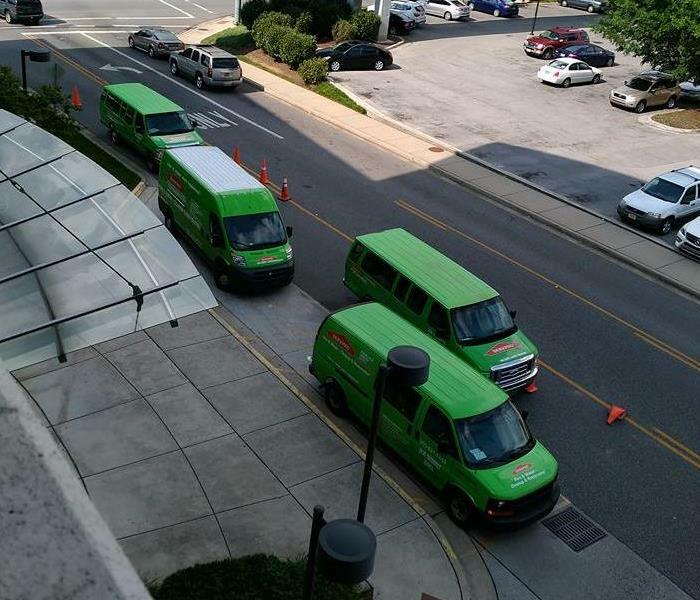 When the Huntsville area was hit with unusually cold weather in January 2014, we were able to get extra equipment from other SERVPRO franchises so that we could help all the Huntsville and Madison County residents who had frozen pipes. 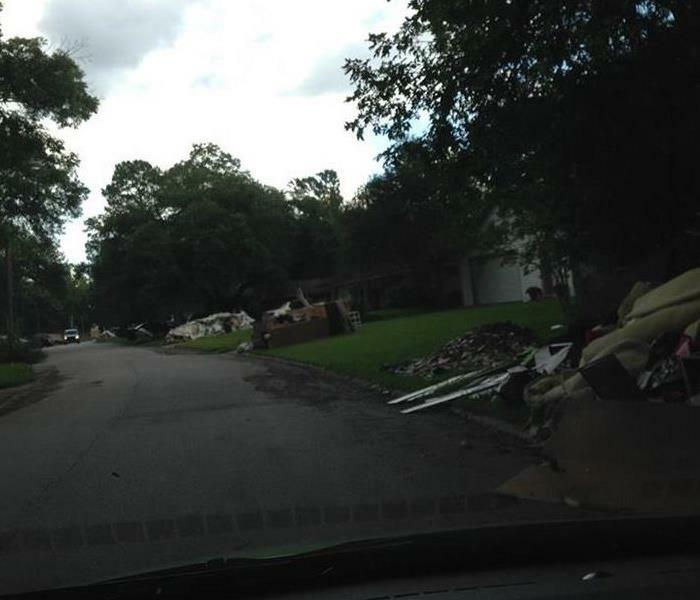 While working the Houston floods in 2015, Key Accounts Manager Robert Gaddis drives down a street that is lined with debris from homes that suffered extensive water damage from the flood. Our Key Accounts Manager Robert Gaddis led our crews during the Houston floods in 2015. He did such a great job that many customers wrote us letters praising his work. You can read a few of them under our testimonials. This is one of the benefits of being part of the SERVPRO franchise family. 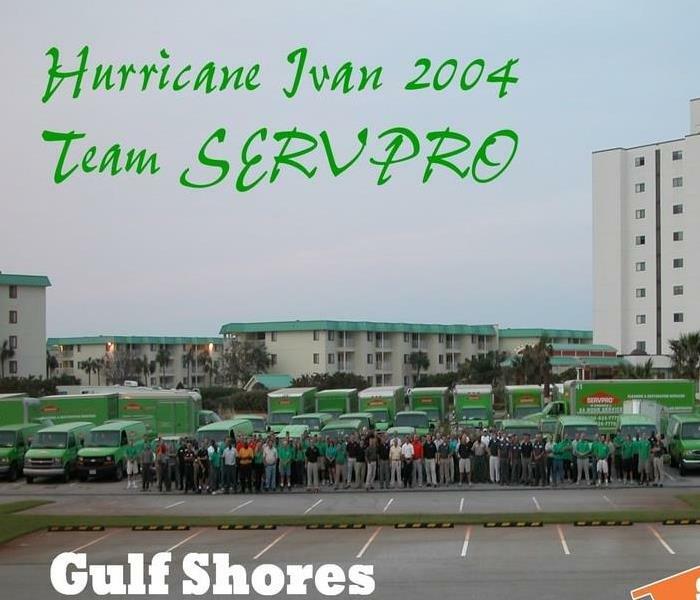 Here are several franchises that all came together to help homes and businesses in the Gulf Shores area after Hurricane Ivan struck and many were left with flood damage. 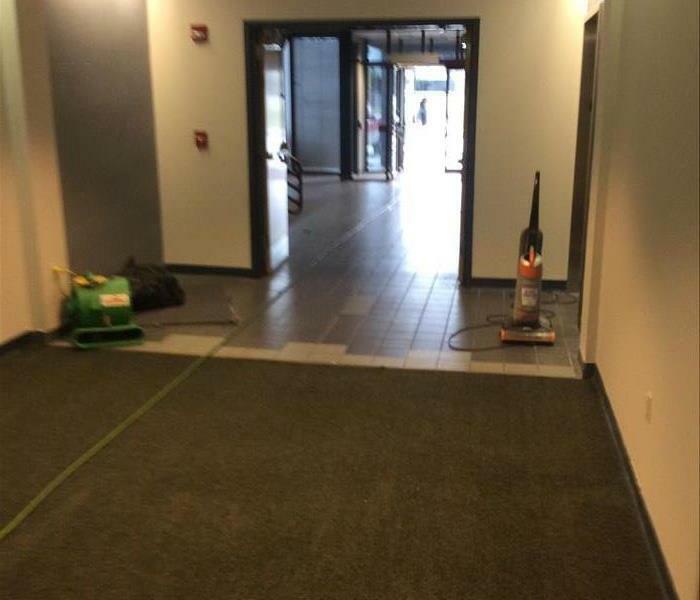 This is another picture of a large general cleaning our crews completed at an office building in Huntsville. Here they vacuumed, cleaned the carpet and mopped the tile floors. After cleaning, they positioned one of our air movers to help the carpet dry faster. 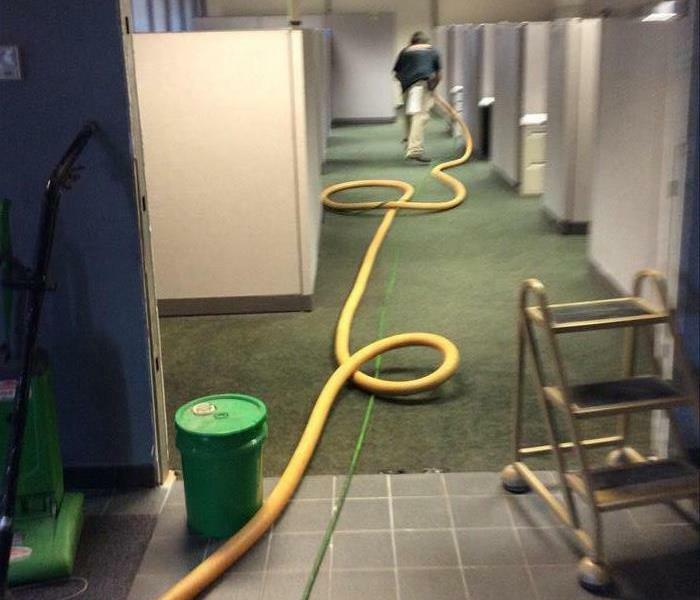 One of our crew members cleans the carpet of an office building in Huntsville. This was a large general cleaning job that took several days. We also cleaned the cubicles, windows, blinds and office chairs. This is another picture from the kitchen of a rental home in Madison, AL. 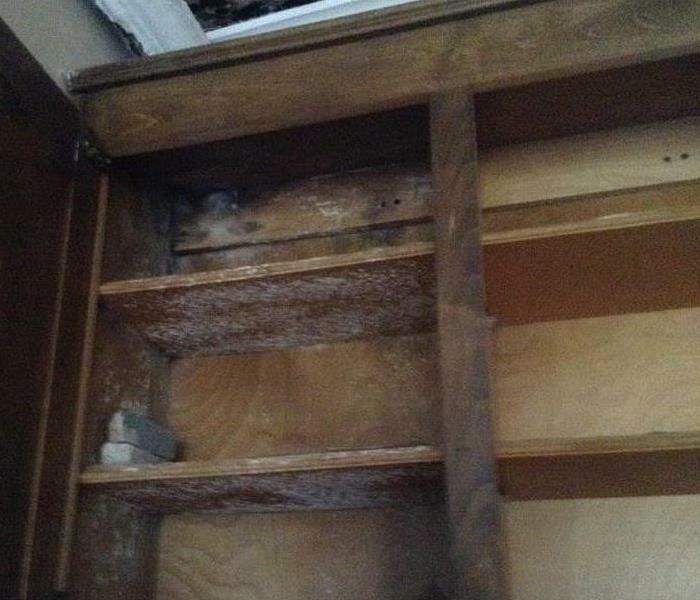 Here you can see the mold growth inside the kitchen cabinets. This mold is a different color than the mold on the ceiling above the cabinets. The mold growth in this Madison, AL rental home spread from the 2nd level down to the kitchen. 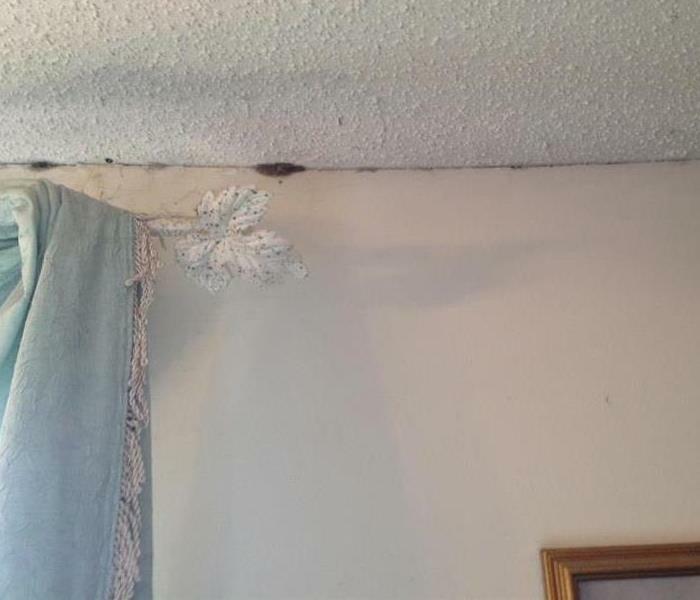 In this photo, you can see mold on the ceiling and the crown molding. Heavy mold growth along the baseboards of a room on the 2nd level of a rental home in Madison, AL. See some of our other gallery pictures to see how the mold spread throughout the house. 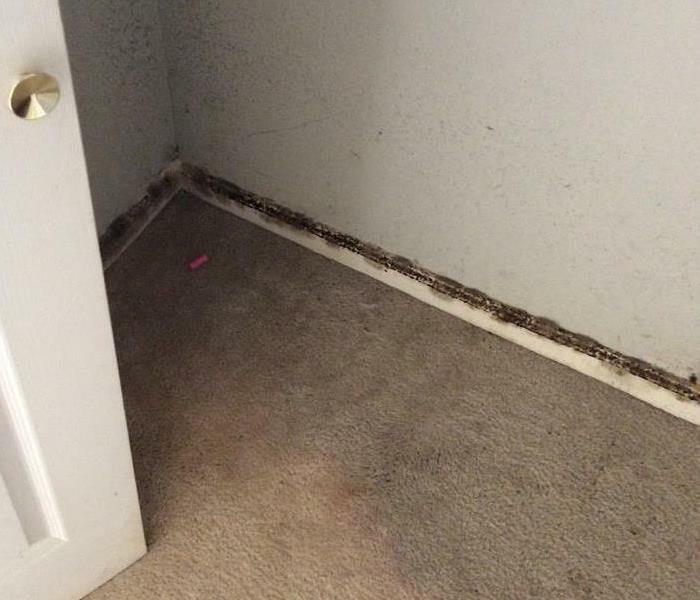 Mold grows on the wall behind the toilet at this rental home in Madison, AL. 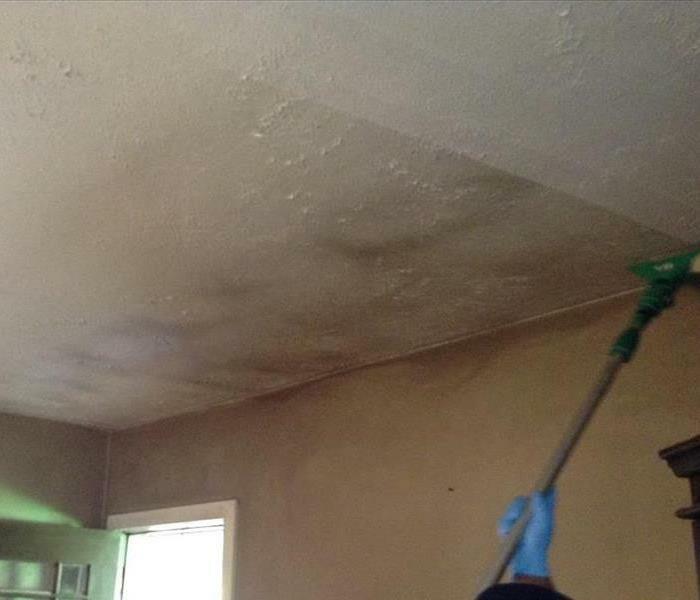 The home was vacant and the mold spread quickly throughout both levels of the home. This is the lobby of an apartment complex in Madison, AL. A pipe leak in an apartment on the 2nd floor caused water damage to several apartments on the 1st and 2nd levels. 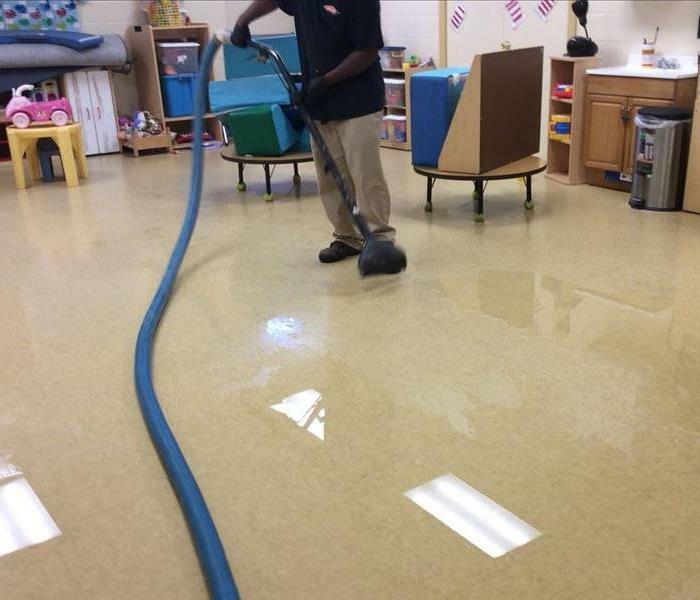 One of our crew members extracting water from the tile floor of a preschool in Huntsville. A broken pipe in a bathroom caused water damage to several rooms of the preschool. Our Production Team, the ones who rush in when needed to get the job accomplished. 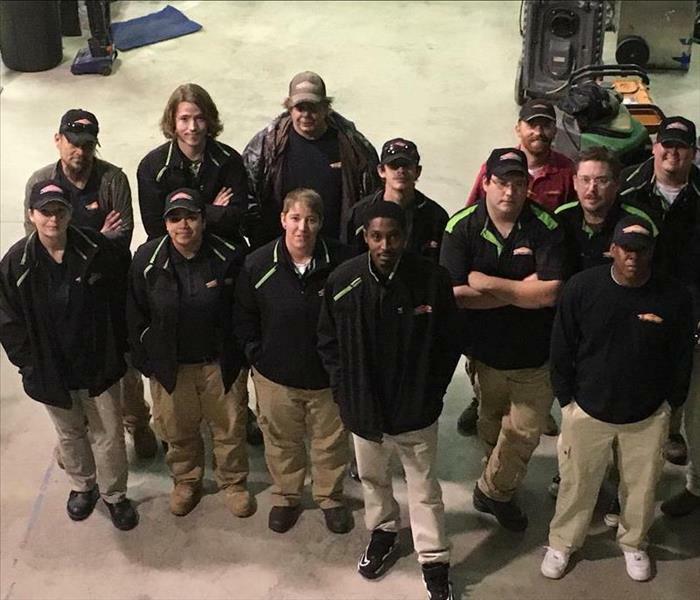 They are always ready to use their training and SERVPRO resources to help you when your home or business experiences fire or water damage. Our office staff works hard to get the job done. They are always ready to help and work so well together as a team. 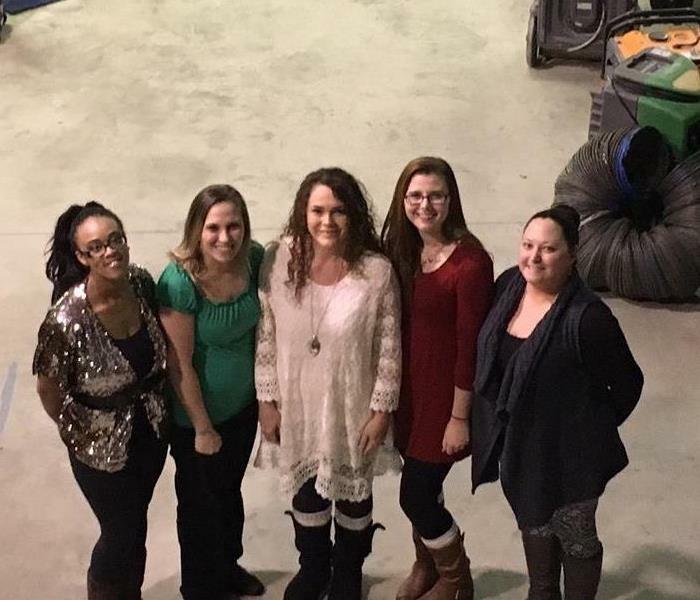 (From Left to Right) Tiana Magee, Ashley Seibert, Patricia Faulkner, Angella Bailey, and Office Manager Amy Reeves. 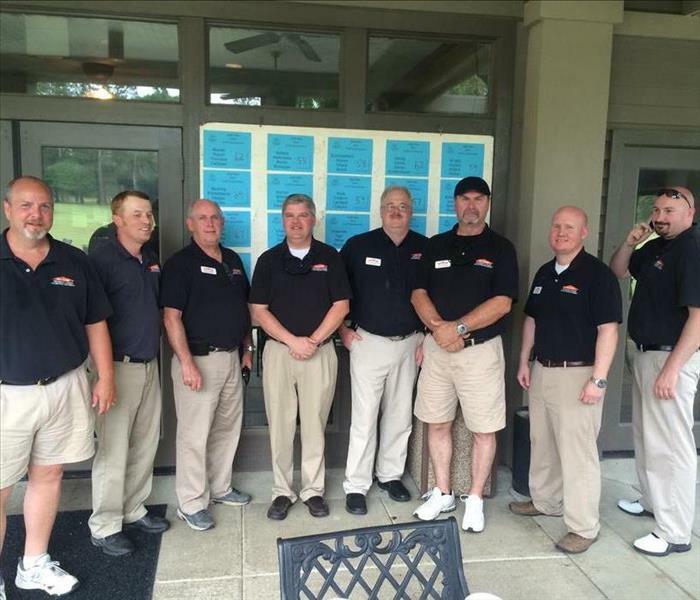 Friends of SERVPRO® are gathered for a picture during the Golf Classic. 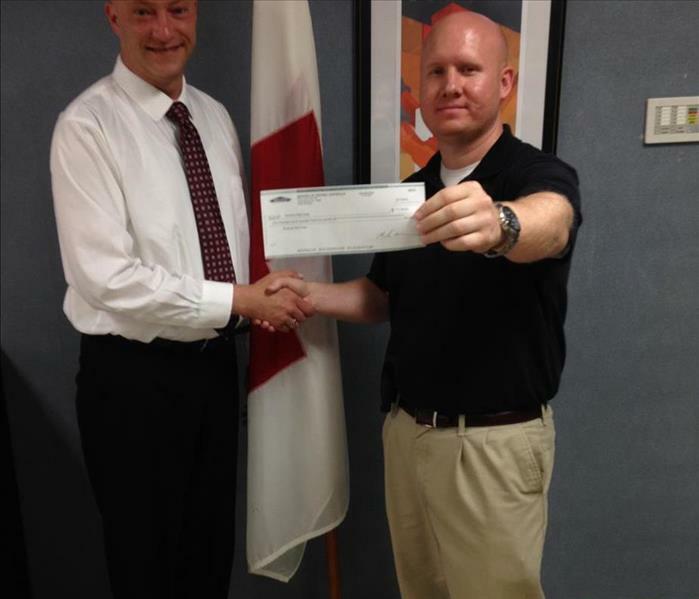 Dennis is handing over the check to the Red Cross Foundation before the annual golf tournament. We were able to raise $1,735.00! Thanks to everyone that participated for your support and contributions! Our team gathered for a photo before the festivities of the Golf Tournament began. In June of 2014, a large 3 story church in Decatur called us with a water loss that originated on the 3rd floor. We call this a "top down" water loss. 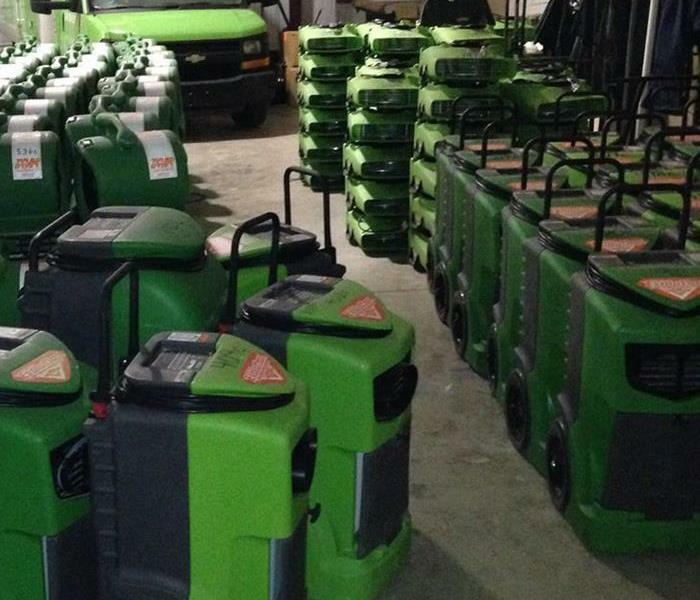 SERVPRO has the industry advantage of having a near limitless amount of equipment and available help from our surrounding Franchises. 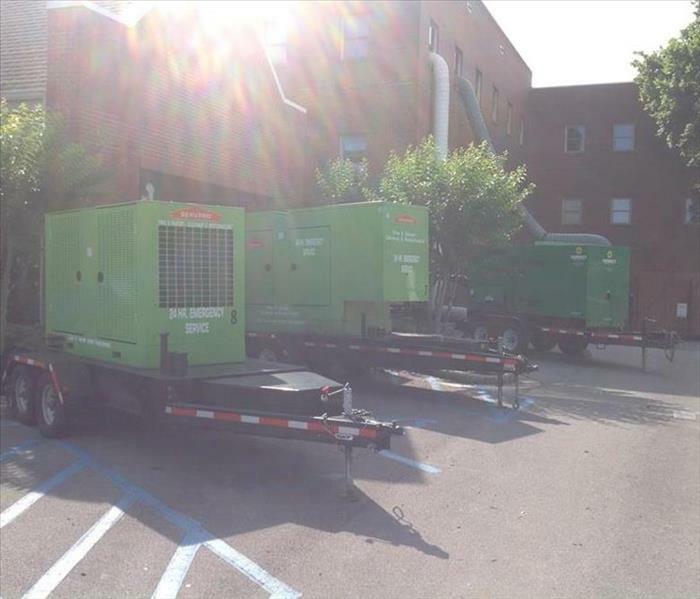 In this instance we had to use three truck pulled dessicant dehumidifiers and hundreds of pieces of smaller equipment (air movers and dehumidifiers) to get this Church back available to open their doors.